To develop and run any java program you need to install JDK in your system. 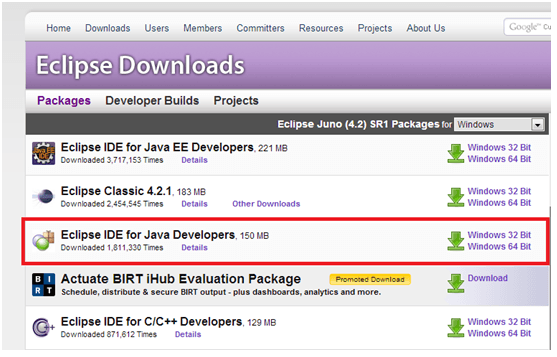 You can download the latest version of Java from here http://www.oracle.com/technetwork/java/javase/downloads/index.html). Once you open the link you will be able to see something like below (Figure 1) screenshot. 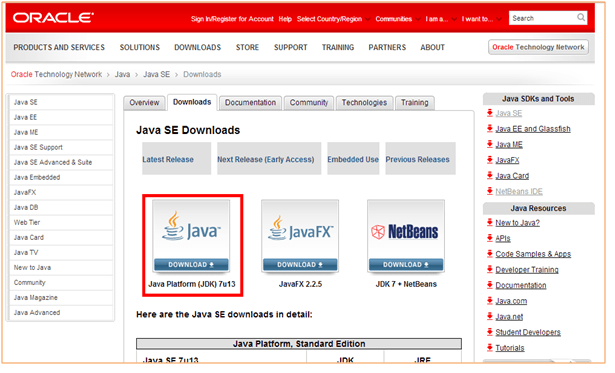 Click on the red colored box to download JDK. After selecting the Windows platform and clicking the Download button you’ll see a Login for Download screen, which is optional: You can skip this step. Click Save File on the pop-up screen, as shown in Figure 2 (the file name depends on the version of JDK). Once download completes you can start the installation. It is very much similar to the installation of other software on windows. A couple of minutes into the installation process you’ll see a pop-up window asking you where to install JRE. I’ll assume that you’ve accepted the default directory (c:\ProgramFiles\Java\jre6), but you can select a different one. Shortly, you should see a message telling you that installation was successful. You can recheck installation using the command prompt. Use “java-version” command to check installed JRE version. The new path takes effect in each new Command Prompt window you open after setting the PATH variable. Java program can be written using a plain text editor and compiled using command window. This is not a productive way of programming. Professional programmers use one of the Integrated Development Environments (IDEs), which include an editor, a compiler,type-ahead help, a debugger, and a lot more. There several popular Java IDEs. (3) IntelliJ IDEA (http://www.jetbrains.com/idea/download/): It comes in two flavors. Free as well as paid version. Paid version is real powerful with great plugins. (4) RAD (http://www.ibm.com/developerworks/downloads/r/rad/): Free for evaluation. We will use Eclipse IDE for demo purpose in our tutorials. Eclipse download site http://www.eclipse.org/downloads/. Eclipse does not need any installation. Just download the zip file and unzip it to a disk drive of your choice. You will find the file eclipse.exe in the Eclipse folder — just run this program. 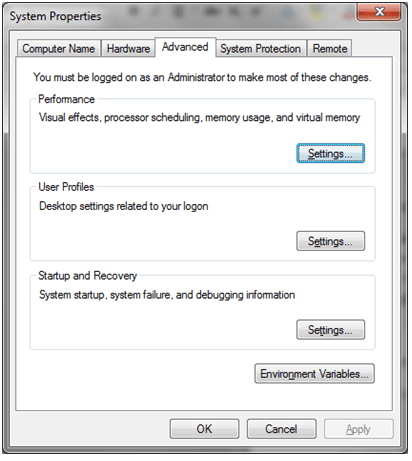 You will immediately see a pop-up window asking you to select a workspace, which is a directory on your hard disk where one or more of your projects is going to be stored. Let’s try to run first Java program. To start writing a Java program you could use any plain text editor. The file that contains hello-world Java code must be the saved.java extension. Create a directory inside C drive like “c:/javadevelopment/”. Now save below code as HelloWorld.java. (If you are using Notepad, select All Files in the Save as Type drop-down to avoid auto attachment of the .txt suffix). Enter the following code in the text editor. Keep in mind that Java is a case-sensitive language, which means that if you named the program HelloWorld with a capital H and a capital W, you should not try to start the program helloworld. Refer screenshot (Figure 6) below for command line output. You can use any text editor to create and edit source files. Create directory using following commands. Create Java source file using vi editor and either type following lines or copy following lines in the file. To compile your source file, change your current directory to the directory where your file is saved. Type the (javac HelloWorld.java) command and press enter. After compilation process ends you will be able to see HelloWorld.class file created in the same folder. 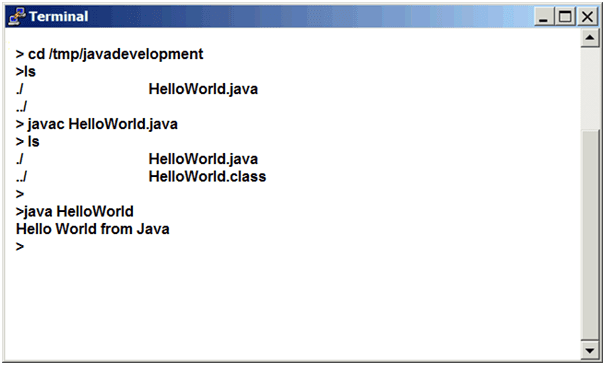 Type (java HelloWorld) command and press enter to see the output on the screen. Please refer figure 7 for commands and screen views on linux terminal. Java is platform independent programming language which means compile once and run anywhere. Java provides built-in functionality for Thread, collection, File IO etc. The Java language is object-oriented (OO) programming language which will allow the programmer to relate java domain objects with real life objects.